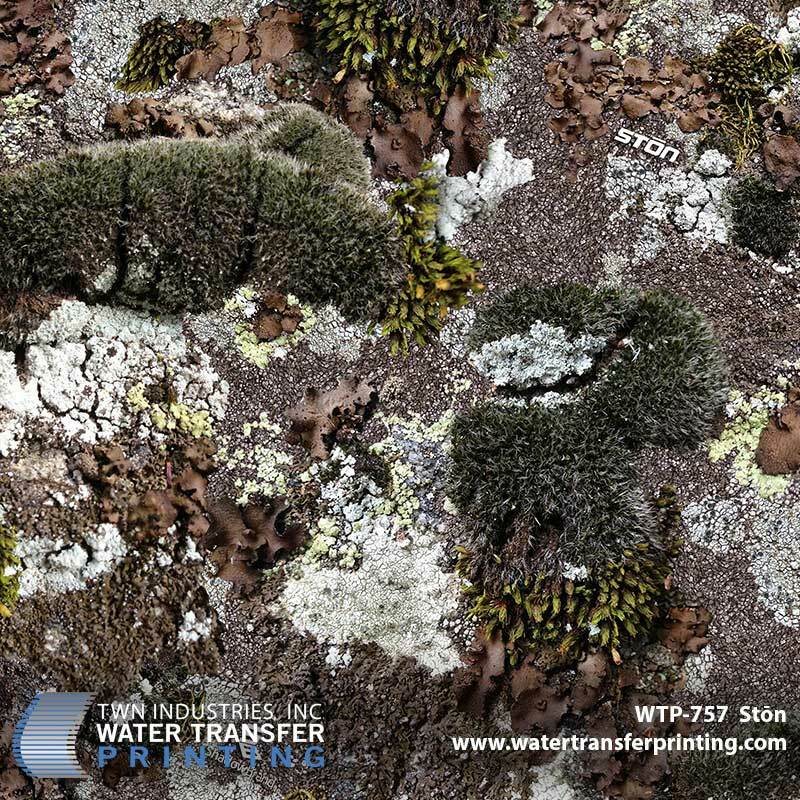 PRINCETON, FL March 11, 2014 – TWN Industries Inc., the leading water transfer printing supplier, announces the premiere of Stōn Camo hydrographic film. The Stōn camouflage line was developed as a solution for applications that span differing seasonal habitats, geography and terrain. Stōn is independent of the changing colors of foliage for concealment, taking its color and texture from a source common to all terrains — naturally occurring color and surface qualities found in boulders, rocks and surrounding ground cover. The first pattern offered by Stōn Camo is optimized for use in multi-terrain applications. It features a multitude of colors and earth tones found in every region — from high-desert to lush marsh areas. Variable depth and realistic natural elements combine to make this pattern an ideal option for concealment everywhere. “Stōn Camo’s first release allows another option for effective concealment. This new pattern’s detailed layering of natural elements delivers a realistic representation of both depth and contrast, providing concealment at a distance and at close range,” stated Mike Richards, Director of Business Development at TWN Industries. Stōn Camo water transfer printing film is available exclusively through TWN Industries, Inc. Three meter accessory packs are available immediately. Part number for Stōn is WTP-757. To find a TWN Certified Decorator who can decorate products for you or to purchase film, call 305-258-9622. The Stōn™ camouflage line was developed as a solution for applications that span differing seasonal habitats, geography and terrain. Stōn is independent of the changing colors of foliage for concealment, taking its color and texture from a source common to all terrains — naturally occurring color and surface qualities found in boulders, rocks and surrounding ground cover. Natural layering of elements delivers a realistic representation of both depth and contrast in the pattern, providing maximum concealment at a distance and at close range. Whether concealed in the shadows or beneath harsh sunlight, naturally-found variations of light and dark enable the pattern to blend well with its surroundings. Stōn camo also benefits from a larger overall imprint — this larger tiling virtually eliminates repeating patterns and allows for a more natural appearance.